Greater Manchester was recently awarded the 7th Award for Sustainable Urban Mobility Planning (SUMP Award), which focused on multimodality, during the European Sustainable Mobility Award Ceremony held in Brussels on 21 March 2019. From the three SUMP Award finalists (which included Basel and Dresden), the British metropolitan area proved to have the most developed concept and ambitious targets in achieving a multimodal transport system covering both the inner city and the outer territories of the metropolitan area, and also demonstrated its strong support to the use of active modes. The overarching 2040 Transport Strategy (i.e. its first SUMP) detailing the long-term ambitions of Transport for Greater Manchester (TfGM) covers all important aspects of sustainable urban mobility planning, and can serve as a positive example for the many European cities that don't yet have a clear, long-term plan. Greater Manchester is a large polycentric city region of 2.79 million residents. The metropolitan area is the country’s first combined authority, representing 10 local authorities (i.e. districts) and their leaders, working together and chaired by a directly-elected mayor. The combined authority deals with a variety of urban policy areas, including growth, quality of life, environment, and technology & innovation. When it comes to mobility challenges, Greater Manchester faces problems that are common to many European metropolitan areas, such as a high number of individual car trips causing traffic jams, and deteriorating air quality. Currently, 2.5 million short trips of 2 km or less are made every day, and 45 % of these trips are made by car. Furthermore, there are 1.7 million daily car trips to destinations across the Greater Manchester area which are longer than 2 km and do not start or finish in the regional centre. Additionally, the fragmentation of mobility solutions is a barrier to rapid and seamless trips in Greater Manchester. This shows the necessity of planning for all modes, to cover a larger regional area than the immediate city footprint. The approach chosen by Greater Manchester is to plan for all modes in order to reduce the modal share of the private car. To respond to the challenges identified by Transport for Greater Manchester during the SUMP preparation process, a clear dedicated plan was adopted for decreasing private car use and providing more sustainable alternatives for local residents. The metropolitan region is currently implementing its first SUMP, which is accompanied by a five-year delivery plan including a defined set of desired outcomes measured by a set of Key Performance Indicators. Regular monitoring of these indicators allows Transport for Greater Manchester to adjust course, depending on issues such as available funding and emerging political priorities, while still working toward the long-term strategy aims. Within the Greater Manchester 2040 Transport Strategy, TfGM’s targets are itemised by spatial theme. This classification of targets helps take into account the different types of journey made on the network in a modally agnostic way, avoiding a planning approach restricted to modal silos and allowing for the adaptation of objectives and measures to certain types of trip and specific areas of Greater Manchester. There is a strong emphasis in the Greater Manchester SUMP on enabling people to travel more easily and safely on foot and by bicycle. Achieving this will help to increase levels of physical activity, as well as reducing the significant number of very short car trips currently made in local towns and neighbourhoods, making them more attractive places to live. This will, in turn, reduce harmful emissions and traffic noise. The ambition of Transport for Greater Manchester within this area is “to create a comprehensive network of on- and off-road walking and cycling routes that make it easier and safer for people to walk and cycle to key local destinations, such as local centres, jobs, healthcare and education, for leisure purposes and for local transport access”. 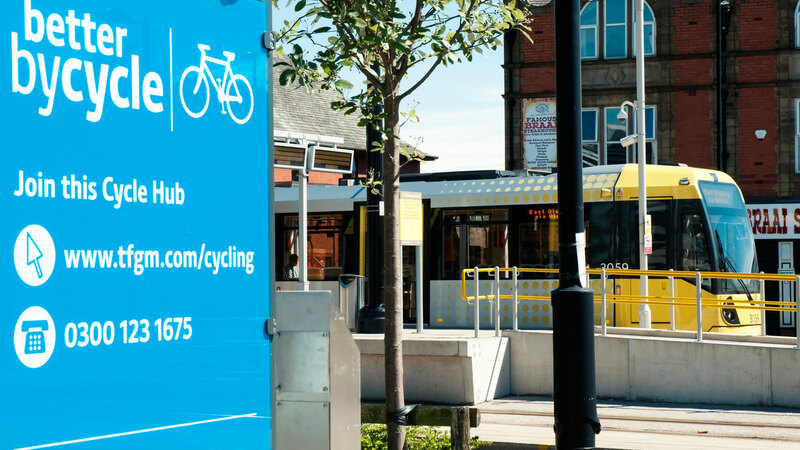 The first step was the publication of a detailed, Greater Manchester-wide walking and cycling infrastructure proposal, in collaboration with all ten local authorities. This followed a proposal made in 2017 by Greater Manchester’s Cycling and Walking Commissioner, Chris Boardman, Olympic medallist. Further to the promotion of active modes, TfGM has adopted a sub-strategy called “Streets for All”, which aims to “design streets which balance the movement of people and goods with the creation of more people-friendly places.” This approach for the movement of people and goods has ambitious goals offering a comprehensive and consistent cycle network, a reliable and accessible bus network, reliable freight access routes and to harness new mobility innovations. In order to develop its SUMP, Transport for Greater Manchester has worked in partnership with the different public transport providers operating in the urban area, and has created a multimodal and multi-operator ticketing structure, called “System One”. This is being further enhanced by TfGM’s multimodal smart ticketing platform “Get Me There”, allowing customers to purchase travel tickets using a smart-phone or a smart-card, and to travel seamlessly across operators. Furthermore, a simpler zonal fare structure is being introduced imminently on Metrolink (i.e. the local light rail system, owned by TfGM) to improve ease of understanding fare structures for customers, preparing for integrated fares in future, required for the development of a ‘mobility as a service’ (MaaS) platform. Greater Manchester is at the starting phase of implementing its SUMP, but the planning approach has a clear and positive long-term structure, as demonstrated by its selection for the 7th EU SUMP Award for multimodality. Moreover, the region has already achieved a significant modal shift over the last two decades, substantially growing its regional centre economy while reducing traffic levels. This has been achieved partly through transport investment stimulating an accessible urban core, which has in turn attracted business investment, thus launching a cyclical agglomeration process. Greater Manchester’s vision for 2040 is to reduce car use to no more than 50 % of daily trips, with the remaining 50 % being made by public transport, walking, and cycling. Through extensive scenario testing, their analysis suggests that achieving this vision will enable the metropolitan authority to deliver growth ambitions, without increasing overall traffic levels, despite the fact that the population is growing rapidly and the city is becoming an important international centre. Without a doubt, the case of Greater Manchester is an excellent example of how a well-planned SUMP can help a metropolitan region to improve its urban mobility situation with creative and well-integrated plans.